This nonfiction book focuses on how to move beyond insecurities and labels and be the person God designed you to be. 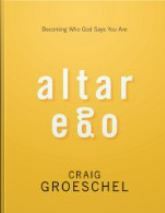 Another great book by Craig Groeschel. My favorite is The Christian Atheist, but I really enjoyed this one as well. Too easily we let ourselves get labeled by past mistakes or who we think we are rather than realizing our full potential. And a lovely quote about hearing no, “I’m convinced, though, that the same boldness that’s required to ask God for big things can handle it if he says no. My faith in God is big enough that I can ask him for anything, and my faith can handle God’s saying no. My faith can handle it because he is the Sovereign God; he’s in charge; he knows.